With the recognition of the benefits of Distributed Generators (DG) to the electric grid, a shift in paradigm from traditional centralized to distributed control has been observed in recent studies on power systems. In a network of multiple microgrids (MG), the collaboration among these units through a distributed control potentially increases the robustness and resilience of the power system. 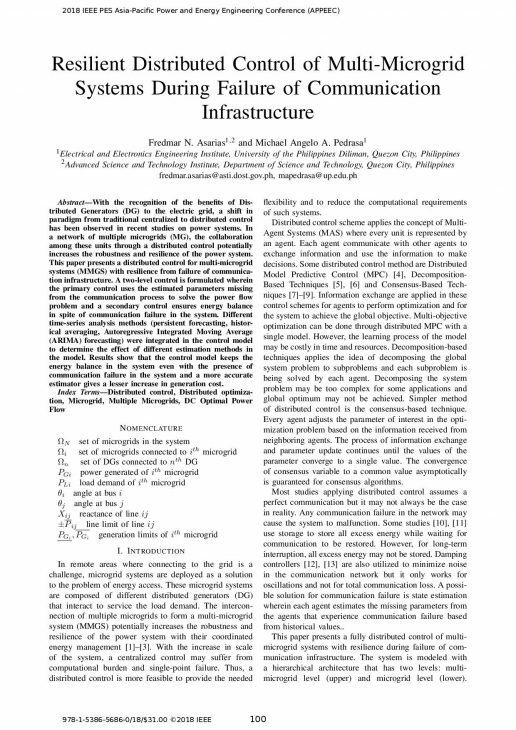 This paper presents a distributed control for multi-microgrid systems (MMGS) with resilience from failure of communication infrastructure. A two-level control is formulated wherein the primary control uses the estimated parameters missing from the communication process to solve the power flow problem and a secondary control ensures energy balance in spite of communication failure in the system. Different time-series analysis methods (persistent forecasting, historical averaging, Autoregressive Integrated Moving Average (ARIMA) forecasting) were integrated in the control model to determine the effect of different estimation methods in the model. Results show that the control model keeps the energy balance in the system even with the presence of communication failure in the system and a more accurate estimator gives a lesser increase in generation cost. Fredmar holds a Bachelor of Science Degree in Electronics and Communications Engineering and a Master of Science Degree in Electrical Engineering. He is currently studying for his Doctorate Degree in Electrical and Electronics Engineering at the University of the Philippines – Diliman. Fredmar started working in DOST-ASTI on April 2018, taking part on projects Smart Streetlights and Unmanned Aerial Vehicle (UAV) under the Research and Development Division.